Merida, 12th February 2014 (Venezuelanalysis.com) – Violent opposition groups attacked government buildings and civilians, and clashed with police and government supporters following peaceful marches commemorating the Day of Youth. The violence has claimed two deaths and left 23 injured across the country. Thirty arrests have been made according to government sources. Venezuela commemorates the day of the youth on 12 February each year in memory of the role of young people in the decisive independence battle in La Victoria in 1814. Today marked the bicentenary of the historic battle. In mid afternoon President Nicolas Maduro delivered a speech in Caracas, praising the morning’s marches as peaceful. However, shortly later one Chavista was reported to have been killed amid clashes involving opposition activists. Juan Montoya, also known as Juancho was shot. 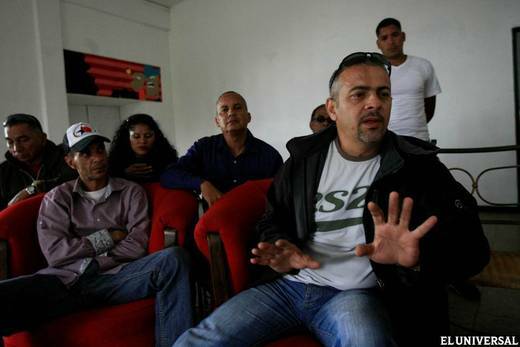 He was a community leader in the Chavista stronghold, Barrio 23 de Enero. This afternoon National Assembly head Diosdado Cabello condemned the shooting, and accused armed right-wing groups of “hunting down” Montoya. “They are fascists, murderers, and then they talk about dialogue,” Cabello stated, referring to armed right-wing activists. The AN head called for calm, and urged against reprisals. Violent opposition groups also attacked the attorney general’s office in Carabobo Park, Caracas. Photographs of the scene indicate the building’s exterior was damaged. A building belonging to the government owned Fundacaracas organisation was also attacked by opposition groups. A few hours later the mayor of Caracas’s Libertador municipality, the PSUV’s Jorge Rodriguez also reported that the judicial offices in Chacao, Miranda, were also attacked. Later in the night the National Guard were deployed to the state owned VTV offices in Los Ruices. Disturbances had been reported in the area, though no further details were available at the time of writing. In the evening, President Nicolas Maduro stated that violent opposition groups had also set fire to five police patrol vehicles. He also stated that a group of around two hundred violent activists had attempted to attack Miraflores Palace after the attorney general’s office. After weeks of small, violent protests in Merida, there was a large march by government supporters in one part of the Andean city, and a larger march by opposition supporters elsewhere. Both were observed to be peaceful by Venezuelanalysis. However, violence began shortly after the opposition march finished. Clashes took place in Merida’s streets after individuals began burning garbage in intersections and erecting barricades. A larger confrontation took place at a major intersection in the city’s north. Witnesses told Venezuelanalys.com that they saw men in balaclavas occupy a number of apartments, and fire live ammunition into the streets below. Riot police blocked the intersection. Hundreds of government supporters gathered a few hundred metres behind the police lines. “We’re defending the city centre,” one supporter told Venezuelanalysis. “I’m marching for various reasons, mainly because I still believe in the project of our country, which still hasn’t been fully realised, but if we work just a bit harder we can do it, we have a lot to do. Also because it’s important to show that we are many, there are a lot of people who believe in this. What’s been happening in Merida is sad, regrettable. It’s a shame that they [violent sectors of the opposition] can’t propose anything without violence. We shouldn’t respond with violence. But the only proposal they seem to have is to get people into power who have never cared about the people, they just want to sell our country to the [US] empire,” Raquel Barrios told Venezuelanalysis, referring to the last four days of violence in Merida. “I’m marching to commemorate the battle of La Victoria, but they [the opposition leadership] are manipulating the youth of Merida and parts of the opposition, they want to put an end to everything we’ve achieved, but they won’t be able to, because we’re peaceful people but ready for any necessary battle,” said Douglas Vasquez told Venezuelanalysis. “Basically I’m marching to rescue Merida. We can’t let Merida be in the hands of violent people. I’m a teacher at the University of Los Andes (ULA), and I feel very ashamed that the recent violent incidents are mostly promoted by people from the ULA, who hope to create discomfort in the people in order to overthrow a consolidated and democratically elected government,” Katania Felisola said to Venezuelanalysis. The opposition march started at the ULA and went down the Americas Avenue after a last minute redirection. Fernando Peña, a chemical engineering student at the ULA told Venezuelanalysis’s Ewan Robertson, “The students have felt the need to show themselves against [the goverment], because they have taken students prisoner in Mérida and Táchira just for expressing their right to protest. Right now feelings are very tense, because the people are tired of the government, [and] the students are the centre of the mobilisation throughout the country. The people now deeply disagree with the decisions that the government makes…living in Venezuela has become ever more difficult”. Other opposition marchers told Robertson that they blamed the government for the violence, for “sending out motorbikes to attack students”. In the violence after the marches, two people have been reported as injured, both shot in the legs. One of those was Jilfredo Barradas, a state government photographer. “It’s a show, everyone knew it would turn out like this, it was planned,” one Merida activist told Venezuelanalysis, referring to the violence both in the Americas intersection as well as on Avenue 3. Further, Gustavo Bazan told Venezuelanalysis, “On Friday they [violent opposition sectors] wanted to store Molotov cocktails [in the apartment where Bazan lives] and break up bricks in order to have rocks. I stepped out of line a bit and I told them that here they weren’t protesting against the government but rather against their own neighbours. I challenged them to take off their balaclavas and said to them they weren’t capable of coming over and having a conversation. They jumped over the fence and three of them started to beat me up. A friend and a building security guard saved me. I filmed them while they prepared the Molotov cocktails”. Electricity minister Jesse Chacon informed through his Twitter account that “violent groups” surrounded an electric substation in San Cristobal and threw Molotov cocktails at it. According to AVN there was also violence in Aragua and Carabobo states “which left material damage”. The governor of Carabobo state, Francisco Ameliach said that “violent groups burnt a truck with liquid asphalt”. Ameliach alleged that the head of the MUD in the state, Vicencio Scarano had financed the crimes. The minister for internal affairs, Miguel Rodriguez Torres, said that violent groups had tried to set the Aragua state government building on fire. Tonight Attorney General Luisa Ortega Diaz informed the public that so far there have been a total of two deaths, 23 injured, and thirty arrests. Along with Montoya, student Basil Da Costa died after suffering a gunshot. She added though that public lawyers were investigating and visiting hospitals to determine the exact number. According to Maduro the two men were both shot in the head, “like the sharp shooters who murdered [people] on 11 April ”. Ortega also said that four CICPC (Scientific Crime Investigation Body) vehicles were set on fire, as well as other private vehicles. Regarding the march in Caracas, she said “they were guaranteed security from Plaza Venezuela to the Attorney General’s Office, there was nothing to impede them”. Maduro also warned tonight that “whoever protests or marches without permission will be detained”. “These are trained groups who… are prepared to overthrow the government in a violent way, and I’m not going to allow this, so I call on Venezuela to be peaceful,” Maduro said. Foreign minister Elias Jaua alleged that Leopoldo Lopez was the “intellectual author of the deaths and injuries in Caracas”. The Ecuadorian government emitted a statement today condemning the “acts of violence and vandalism by irresponsible members of the opposition”. “We hope for the prompt reestablishment of social peace in our brother country and because respect for the government and its legitimately constituted institutions has precedence”. “This a call put out by the students and supported by the Democratic Unity [MUD opposition coalition], this march on the day of the youth is taking place when the government is repressing, with jail, with torture,” Leopoldo Lopez told CNN yesterday, in anticipation of today’s events. “The government has an agenda of violence and as they control the monopoly [sic] over communication in Venezuela they hide it…the call that has been made is to be in the street,” he said, blaming the violence over the last week in Merida and Tachira on the government. Speaking tonight on Noticias 24, Lopez blamed the national government for today’s violence and deaths. “Who is generating the violence? The government… repression by the national guard, the police,” he said. Some of the top tweets by the opposition at the moment also blamed the Tupamaros groups. The Tupamaros are now quite small, but are often blamed for any violence that takes place. They support the national government. “They (Tupamaros) are animals and they should all die,” wrote Daniel Garcia. “Hitler, come back and put all the Tupamaros in gas chambers” wrote Andreina Leonett. “When the first student dies all the streets of Venezuela will burn,” wrote Jose Gamboa. Over the last week far right opposition leaders such as Leopoldo Lopez have been calling for people to “go out into the street” in order to achieve an “exit” of the national government.